Welcome to Me Like Paleo! This blog is just one of a million blogs devoted to the Paleo lifestyle. But that’s fine. I really started this blog for myself – to help capture all my favorite Paleo recipes, resources, etc. and relegate them to one place. I’ve been eating Paleo for almost two years. It was a slow journey. Around 2009, I was introduced to Weston A. Price and the concept of traditional diets. 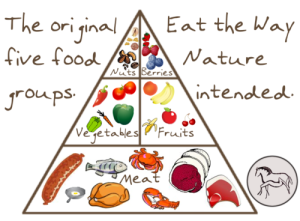 I followed a WAPF approach for about a year and a half, then stumbled onto Tim Ferriss’ dietary theory (protein, veggies, no grains, no fruit, lots of legumes, scheduled calorie-loading), around which time I joined my first CrossFit box in Arlington, VA. From there, it wasn’t a hard jump to adopting a Paleo/Primal lifestyle. And I feel so great that I’m never looking back. I’m a certified health coach (CHC) through the Institute of Integrative Nutrition and I’m listed on the Paleo Physicians Network and Primal Docs. I am not a doctor, and I do not treat, mitigate or prevent disease. I simply share recipes, facts, etc. that have worked for me, and what continues to work for innumerable other people. I simply believe in providing people with information so that they can make make their own decisions. If you need help or have questions, please don’t hesitate to contact me. Disclaimer – The information presented here is not intended or implied to be a substitute for professional medical advice, diagnosis, or treatment. All content, including text, graphics, images and information, contained in or available through this material is for general information purposes only. Me Like Paleo encourages you to review all information regarding any medical condition or treatment with your physician. NEVER DISREGARD PROFESSIONAL MEDICAL ADVICE OR DELAY SEEKING MEDICAL TREATMENT BECAUSE OF SOMETHING YOU HAVE READ HERE, OR ACCESSED VIA THIS PRESENTED INFORMATION. Me Like Paleo is not responsible nor liable for any advice, course of treatment, diagnosis or any other information services or products that you obtain through this material.